Venture capitalists invested $5.8 billion in 758 deals in the first quarter of 2012, according to a MoneyTree Report from PricewaterhouseCoopers LLP and the National Venture Capital Association (NVCA) . 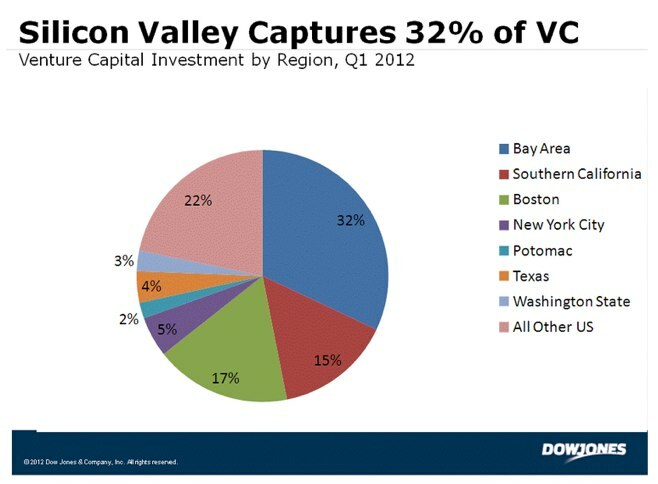 The report shows that after a strong fourth quarter 2011, VC investment activity for the quarter fell 19 percent in terms of dollars and 15 percent in the number of deals compared to the fourth quarter of 2011 when $7.1 billion was invested in 889 deals. While the Life Sciences (biotechnology and medical device industries combined) and Clean Technology sectors saw decreases in both dollars and number of deals in the first quarter, there were double-digit percentage increases in dollars invested in the Consumer Products and Services, and Telecommunications industries. Additionally, investments into companies in the Later stage of development experienced an increase, rising 11 percent and accounting for 40 percent of total dollars invested during the first quarter of 2012. The Software industry received the highest level of funding for all industries with $1.6 billion invested during the first quarter of 2012, but still saw a 18 percent decrease in dollars, compared to $2 billion invested in the fourth quarter. The Software industry also had the most deals completed in Q1 with 231 rounds, a 12 percent decrease from the 262 rounds in the fourth quarter of 2011. 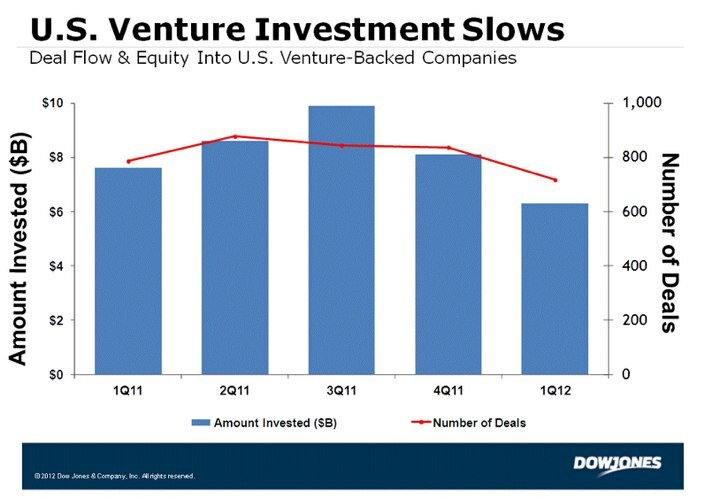 Dow Jones VentureSource reports in a separate study that U.S.-based companies raised $6.3 billion through 717 venture capital deals during the first quarter of 2012, an 18% decline in capital and 9% decline in deals from the same period last year. 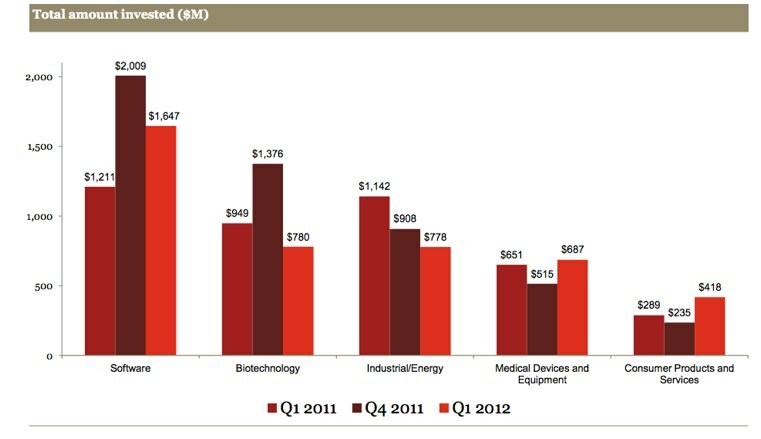 And the median amount invested in a financing round fell 13% to $4 million in the first quarter of 2012. Internet-specific companies received more than one billion dollars for the eighth consecutive quarter with $1.4 billion going into 188 deals, which is 3 percent lower in dollars and 23 percent lower in deals than the fourth quarter of 2011 when $1.4 billion went into 244 deals. Eleven of the 17 MoneyTree sectors experienced decreases in dollars invested in the first quarter, including Semiconductors (43 percent decrease), IT Services (26 percent decrease), and Industrial/Energy (14 percent decrease). The Consumer Products & Services sector experienced a 78 percent increase during the quarter due to the largest deal of the quarter ($238 million) occurring in that sector. Even enterprise investments, which saw two years of growth, slowed, says Dow Jones. In the first quarter, 100 deals raised $947 million, a 29% decline in deals and 10% decline in capital raised from the same period a year ago. Seed stage investments fell 9 percent in dollars and 41 percent in deals with $141 million invested into 53 deals in the first quarter. Early stage investments fell 31 percent in dollars and 24 percent in deals with $1.6 billion going into 290 deals. Seed/Early stage deals accounted for 45 percent of total deal volume in Q1, compared to 53 percent in the fourth quarter of 2011. The average Seed deal in the first quarter was $2.7 million, up from $1.7 million in the fourth quarter. The average Early stage deal was $5.6 million in Q1, down from $6.1 million in the prior quarter. First-time financing (companies receiving venture capital for the first time) dollars decreased 22 percent to $783 million in Q1, the third lowest level in survey history. And, the number of deals fell 28 percent to 195 deals in the first quarter, the lowest level since the third quarter of 2009. First-time financings accounted for 14 percent of all dollars and 26 percent of all deals in the first quarter, compared to 14 percent of all dollars and 30 percent of all deals in the fourth quarter of 2011. Companies in the Software, Media & Entertainment, and IT services industries received the most first-time rounds in the first quarter. The average first-time deal in the first quarter was $4.0 million, up slightly from $3.7 million in the prior quarter. Seed/Early stage companies received the bulk of first-time investments, garnering 81 percent of the deals. Dow Jones reported that in the U.S. specifically, seed- and first-rounds accounted for 44% of deals and 21% of capital invested during the first quarter, the same proportion of deals as the corresponding period last year but an increase from 16% of capital raised in that quarter. Expansion stage dollars decreased 32 percent in the first quarter, according to the MoneyTree report, with $1.7 billion going into 207 deals. Overall, Expansion stage deals accounted for 27 percent of venture deals in the first quarter, a slight uptick from 26 percent in the fourth quarter of 2011. 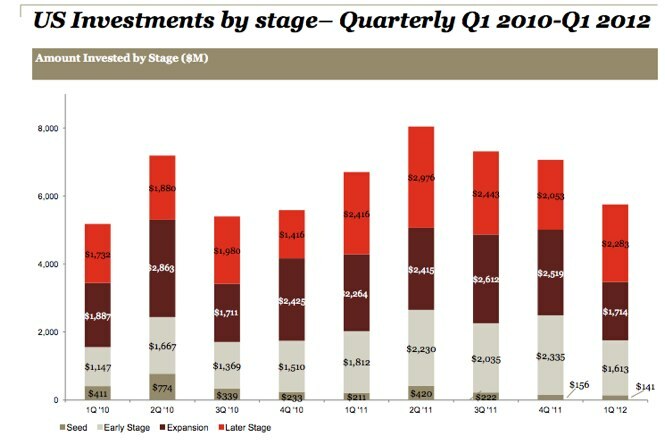 The average Expansion stage deal was $8.3 million, down from $10.9 million in the prior quarter. Investments in later stage deals increased 11 percent in dollars and 13 percent in deals to $2.3 billion going into 208 rounds in the first quarter. Later stage deals accounted for 27 percent of total deal volume in Q1, compared to 21 percent in Q4 when $2.1 billion went into 184 deals. The average Later stage deal in the first quarter was $11.0 million, which decreased slightly from $11.2 million in the prior quarter. The slump isn’t particularly surprising-other reports have shown a similar trend for the first quarter. But global managing partner of PWC’s VC practice, Tracy Lefteroff says that the improvement in the public markets during the first quarter could lead to an increase in VC dollars spent in the second quarter. “The overall decline in investment in the first quarter underlies several shifts occurring in the venture space,” said Mark Heesen, president of the NVCA. “The industry continues to contract and consolidate which is beginning to manifest itself in fewer dollars being invested in fewer deals. Yet, we feel that the overall impact will be positive for the asset class as only the best entrepreneurs and technologies will be funded at rational valuations.” He adds that with the exit market and M&A improving, VCs could be pouring more money into first time deals in the coming months.